I spend a large portion of my life on Etsy. I would like to say the majority of time is spent focusing on my shop, updating, tagging, selling, making my millions… but I have to admit I spend most of my time shopping. My favorite items list is beginning to get a little out of control, and I buy a large portion of the items I end up favoriting. It does make me feel better knowing I am helping my fellow shop owners, I support handmade, I support the arts. As the days leading up to the holidays grew shorter, my time on Etsy grew longer. I had the majority of my gifts covered through the many offerings of Etsy, including a beautiful green, beaded and braided statement necklace for my mom. My mom’s wish list for my sister and I is always the same, any clothes or jewelry you pick out. She loves nothing more than being dressed and accessorized by us, and I love nothing more than shopping. I knew I wanted a cute statement necklace, it had to be in the blue or green color family. 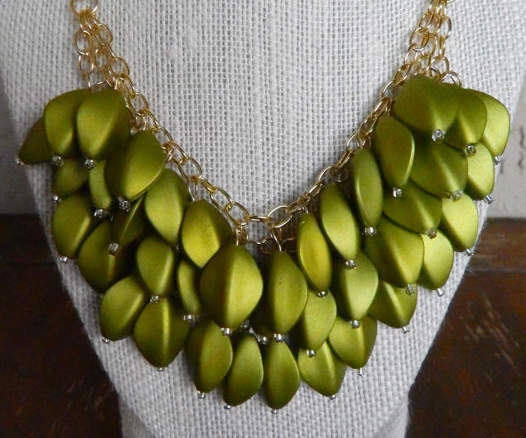 If you type in “green statement necklace” in Etsy it is unbelievable the amount of items you have to sift through. I was at a point of hitting the “next page” button automatically, and going crossed eyed as I stared at necklace after necklace. Suddenly I saw the braided necklace from AquaGiraffe and I was set. It was cute, fun, trendy, and without a second thought I bought it. AquaGiraffe, run by Kimberly out of Orlando, FL, has a variety of products in her shop. 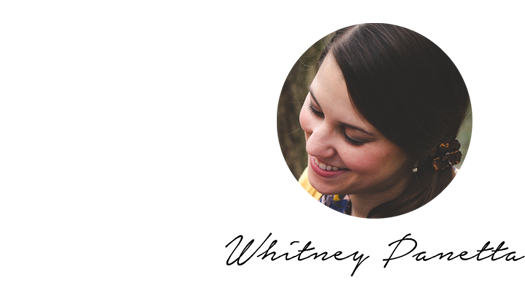 From head scarves to trendy jewelry she has an adorable selection to choose from. I was very excited when she agreed to participate in a giveaway, and offered her Petal Statement Necklace as the prize. I had already noticed this necklace as I recently browsed her shop, and am slightly bummed I’m not eligible to enter my own giveaway. I just might have to make another purchase in the near future. 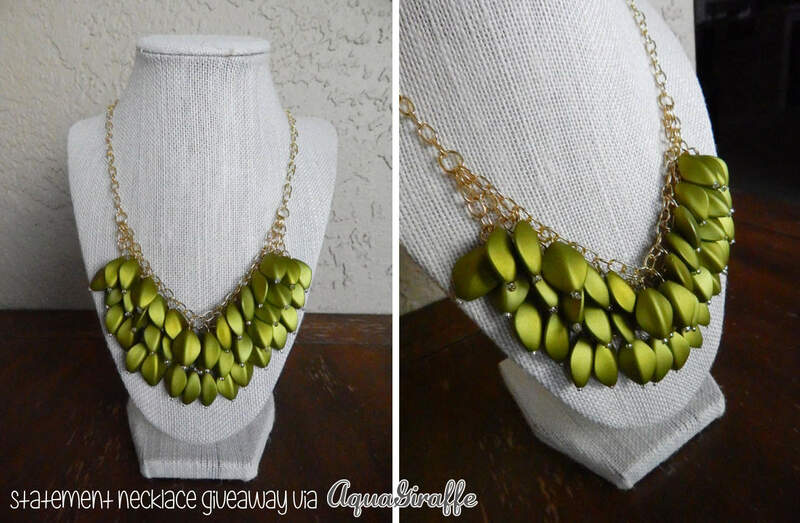 Enter to win this beautiful, fashionable necklace by liking your favorite item in Kimberly’s shop here. After you like an item share the link to the item in a comment below. Want more chances to win? Like my Etsy shop here and link to your favorite item in a separate comment below. Like my Facebook page here and comment a third time with the name you liked the page under. A winner will be randomly selected on Thursday 2/13 using the plugin, “And the Winner Is…” The winner will be e-mail and has 24 hours to confirm their prize before a new winner is selected. Thanks for taking the time to check out my blog and enter my giveaway! A big thanks to Kimberly at AquaGiraffe for donating a necklace to one of my lucky readers. Whether or not you are the winner don’t forget to support local, handmade goodies. Be unique and find one of a kind creations on amazing websites like Etsy! I favorited the J. Crew Inspired White Pearl Cluster Necklace in Silver. https://www.etsy.com/listing/176990345/petal-statement-necklace-in-ruby-red?ref=shop_home_feat_2 I liked the red petal necklace- so pretty! I wound up liking a lot of them! But the plum purple chunky infinity scarf was my absolute favorite! I think the Vintage Inspired Phonograph Music Player is so sweet. I would hang it over the CD player – an homage to the original. This item is my favorite – gorgeous! dshared on my fb page! I favorited the Beaded Braid Statement Necklace in Green – love!! I favorited the Eclectic, Bohemian, Nature Inspired, Birch Tree Paintings – so unique! And now I like you on Facebook too!